Shaped like a traditional bell boot, Quick-Wrap bell boots provide the ultimate protection in hoof and soft tissue protection for performance horses. 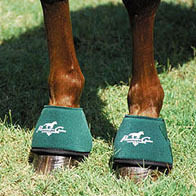 Covering the whole hoof as well as the coronet band and the bulbs, they provide excellent shock-absorption. Lycra binding- won't rub!